There are two things every swimmer on Edisto Beach should know: Yes, there are jellyfish, but most of them are totally harmless. Many times, jellyfish wash up on the beach and look like gooey eyeballs with a stem. These are the jellyfish that are the most common in the area and are known as the Cannonball Jelly. They dont have tentacles and swimmers would have to go out of their way to be stung by these jellyfish (which are the least venomous of the South Carolina jellies). 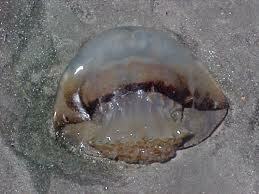 Then theres another kind of jellyfish that looks like the Cannonball Jelly, which is the Mushroom Jelly. These are similar in appearance to the Cannonball, but they have tentacles. They are not hazardous to humans, but they do like to annoy commercial fishermen by damaging nets and slowing down trawl lines. Both the Cannonball and Mushroom jellies are whitish with a brown ring around the bottom. Two jellyfish that South Carolinian residents and vacationers neednt worry too much about are the Southern Moon Jelly and the Lions Mane. The Southern Moon Jelly has a transparent saucer-shaped bell which provides an excellent view of its pink horseshoe-shaped gonads. These are rare in South Carolinian waters and its sting is minimal. The Lions Mane comes around during the winter months when most people are not in the water. They are saucer-shaped and have eight clusters of tentacles dangling underneath. A sting from this jellyfish is mild. Now onto the jellyfish people do not want to encounter. The Sea Nettle is responsible for many stings during the summer months. This jellyfish is saucer-shaped and has a brown or red hue. Its tentacles trail behind it in the water. The sting from a Sea Nettle varies from person to person, but as someone who has been stung a handful of times during my lifetime in the water, it feels like brushing against a head of hair in the water and quickly turns into feeling like that head of hair had needles in it. The pain is more irritating than anything, but it is important to get the nematocysts (stingers) off of the skin. These nematocysts discharge into the skin and cause the stinging sensation when they release the venom of the jellyfish. Sea Wasps are the cube-shaped jellyfish that are the most venomous jellies in the South Carolinian waters. They pack a serious punch with their sting which could cause hospitalization. They have several long tentacles dangling from their cubed body. Fortunately, these are not prevalent in the area. Though not indigenous to the area, the Portuguese Man-of-War sometimes drifts into the water. These feature a gas-filled clear bubble which acts as a float for its purple-blue body and tentacles which can reach up to 60 feet long. The sting from this jellyfish can cause severe pain, nausea, fever, shock, collapse, fainting, and muscle pain. Again, these jellyfish are extremely rare in the area, but it is important for any ocean swimmer to be aware of them. If you are stung by a jellyfish, remove any tentacles that are adhered to the skin (generally, the tentacles do not stay on the skin, but merely brush across an arm or a leg). Use anything available to get the tentacles off to avoid being stung again. Contrary to popular belief, alcohol, urine, and picric acid should not be used on a jellyfish sting as they actually cause more nematocysts to release venom into the skin. Simple products almost everybody has at home are great for reducing the effects of the sting like mean tenderizer, baking soda, vinegar, and sugar (any one of these substances will do). Scraping a jellyfish sting with something like a credit card may also help remove the nematocysts and alleviate the stinging sensation. After treatment of the sting, the area will generally produce raised red bumps and could be sore or itch. In severe cases, medical treatment may be needed, but generally this isnt the case. I have been going since 1998 Four Weeks every summer! I have only been stung once. Out of our whole group (16) We have probably gotten stung 10 times maybe. I remember when I worked at Whaley's there were days we treated 2 dozen Jellyfish stings. Old Mr. Whaley would charge $2 for a gallon of bottle water but he never charged anybody to treat their jellyfish stings. As a native, I never go down to the beach without a small jar of vinegar. I would recommend that as soon as you got stung, rub the area with very wet sand for a litle bit then douse the area with vinegar. I also carry ibruprofen which also helps with the pain afterwards. I don't know if any of this is medical science, but it seems to work for me. im going to edisto this sat. should i be really worried about the jellies? ?